In our Glossier Solution review, three people with different skin types and concerns give the “skin perfector” a run for its money. It seems like every other week that Glossier releases a new product. 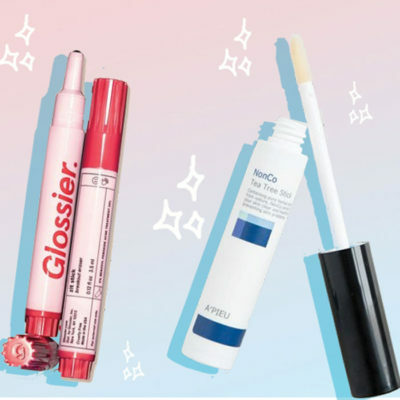 While we’re always intrigued by all of the company’s makeup offerings, it’s when a Glossier skin care product is released that really piques our attention. I mean, obviously. We at The Klog are truly obsessed with skin care. And while Glossier has released a bunch of cult favorite skin care items (the jelly cleanser, the sunscreen, etc), when the company released an exfoliator, we were especially interested. 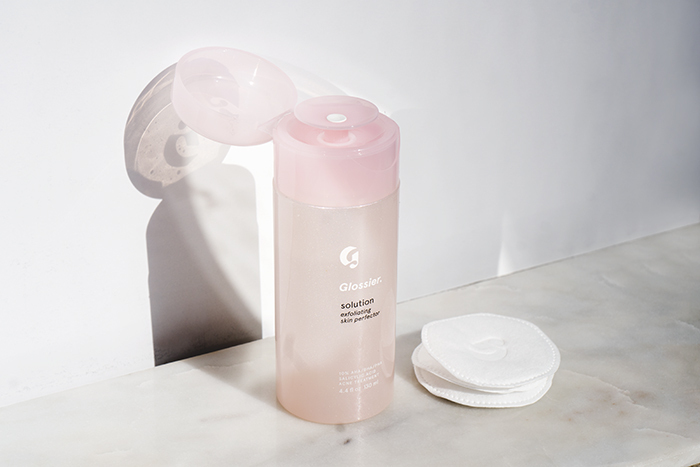 According to Glossier’s product description, Solution is billed as an “exfoliating skin perfector” that uses acids to “gently […] scrape off the surface of your skin.” This basically means that Solution is an acid toner that will help remove dead skin cells and clear pores and—depending on the acids in the toner—help reveal brighter and more balanced skin with fewer visible blackheads. 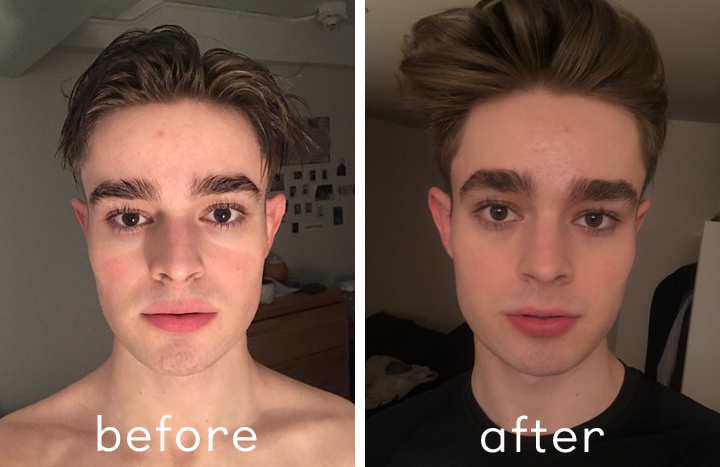 I believe a good acid toner can show results in as little as a week so I was interested in seeing the kind of results Solution would provide after two weeks of consistent use. So I ordered three bottles and tried one bottle for two weeks and asked Peggy, a customer experience associate at Soko Glam and Ben Neiley, former Klog intern, and current contributor (and glorified acid toner enthusiast), to test the other two bottles for two weeks. Below are our experiences. Before we get into our firsthand experiences, let’s break down the ingredients in the formula and what you get when you purchase it. For $24 (a pretty decent price for an acid toner, in my opinion), you get the bottle of Solution and a pack of 60 cotton pads embossed with a Glossier “G” on them. Upon first impressions, all three of us were surprised by how little of the product you get for the price—for comparison, you get 130ml of Solution for $24 while you get 250ml of Pixi’s Glow Tonic for $29. But I must say, I love the cotton pads. They have the perfect feel—not too soft and not too hard—for swiping on an acid and they are a great size. When it comes to what’s in the formula, Solution contains an impressive mix of three different types of acids: AHAs (in this case, lactic acid and glycolic acid), BHAs (0.5% salicylic acid), and a PHA (gluconolactone). It’s awesome that there’s a mix of so many acids in this product, but the only issue is that Glossier doesn’t tell you how much of each AHA is in the formula. It says that overall there’s a 10 percent blend of acids, so if there’s 0.5% salicylic acid, I’m assuming there’s about 3 percent each of glycolic acid, lactic acid, and gluconolactone. These aren’t very high amounts for each acid but definitely enough to make a difference on skin that hasn’t used acids before. The rest of the formula includes some other standout ingredients, notably niaciniamide for brightening, glycerin for hydrating, and (regrettably for some) fragrance. Overall, it’s pretty run of the mill when it comes to acid toners. I asked a few derms to look over the ingredients and offer their initial thoughts. Rachel Nazarian of Schweiger Dermatology Group in New York City, loves the powerful combination of acids, but does warn sensitive skin types to be careful before trying Solution. Vivian Bucay, a dermatologist in San Antonio, is also impressed with the acids in the formula, but questions the exact power they can have since the percentages aren’t listed. “I like combination of salicylic acid, lactic acid, glycolic acid, gluconolactone, and phytic acid,” says Bucay. “But without knowing the pH of this product or the concentration of glycolic acid, it’s not possible to know how much free acid is available. The amount of free acid will affect how much exfoliation occurs.” We checked with Glossier, and they informed us that the pH level of Solution is between 3.5 and 3.9. Heads up: I have sensitive skin. I also was recently diagnosed with PCOS so I’ve been suffering from an onset of random bouts of acne that I’ve never really encountered before in my adult life. I had never really used acid toners before but I jumped at the chance to try out Solution in hopes that it would clear up all the little whiteheads that were starting to show up. Also, I just turned 28 and I’ve become increasingly concerned about the dullness and the subtle fine lines that are starting to show up on my forehead, around my eyes, and around my mouth. I hoped that Solution would help regularly exfoliate my skin for brighter and younger-looking skin. So that was fun! Eventually, the boil went away, and my “after” picture is what you see after I used Solution for two weeks. Overall, I think my skin definitely looks more balanced and I was super happy with how it handled the persistent blackhead on my nose. After I used Solution for 14 days, my blackheads were definitely not as intense. But did it help tame my whiteheads? Sort of, but not as much as some other acid toners. I think Paula’s Choice Skin Perfecting 2% BHA Liquid actually is my best bet when I’m having a big acne attack since it has a high concentration of salicylic acid to really attack the excess sebum. And when it comes to an anti-aging acid toner that will smooth fine lines and really brighten my skin, I’ll go for Pixi’s Glow Tonic since it contains a strong percentage of glycolic acid. I do love Solution for those times when I want a do-it-all acid toner to target multiple issues at once. Sure, it won’t be the most effective at getting rid of both wrinkles and acne, but when I’m dealing with less mild versions of both of these issues, I reach for Solution. It gets the job done and is great when you want a light exfoliation. APP (Avid Pimple Picker) here! I suffer from hormonal acne on my cheeks and chin. When I’m not having a breakout, I’m busy tending to my acne scars, which can take over a month to fade away; boy, are they stubborn. While I’m not proud of my habits, it happens to the best of us. When Renee offered up the Glossier Solution to test, I was a bit skeptical but kind of excited. The thought of being away from my Acwell Licorice pH Balancing Cleansing Toner every night made me anxious, but I gave my skeptical trust to Solution. The first night using this over a freshly picked patch of acne on my cheek, the scent was a bit unpleasant and reminded me of the teeny herbal pills my mom gave me when I had a stomach ache. It dissipated quite quickly but it tingled— an experience I’ve never had before. I woke up the next morning, while not expecting a miracle, was hoping that there was some immediate change—nothing. 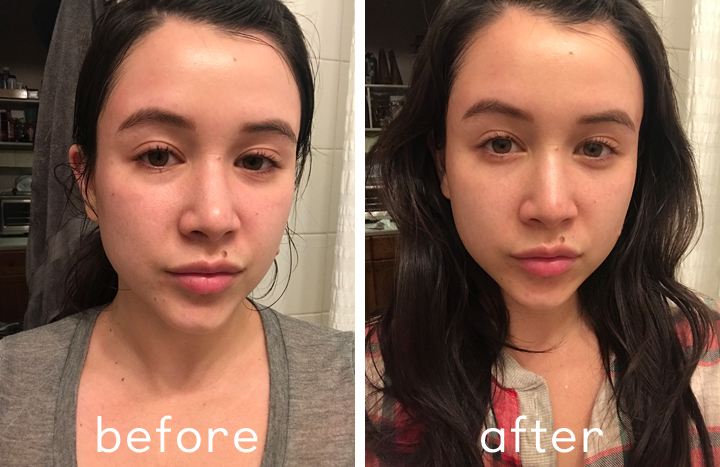 I kept using it over the course of two weeks and noticed that the acne healed up and acne scars barely noticeable—in two WEEKS! I tested this again on another freshly picked patch, and had the same results. 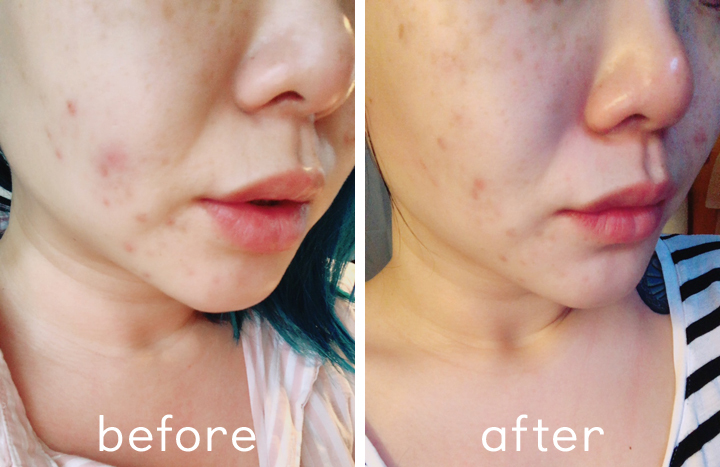 While it didn’t keep my acne at bay or stop it from coming back, it did heal it up much faster when using Solution. With this knowledge of the effects it has on my skin, I confidently pick my pimples knowing Solution has my back; it’s awful, I know. The Solution is one of my holy grails, and I would likely purchase after I’m out. When I first heard about Solution and looked it up, I was greeted with the same hype that surround any Glossier product release: Hordes of people claiming it saved their skin and was the best product they’d ever used (with some bloggers admitting that they received the product for free). So, as with any product, I was skeptical. However, unlike most of Glossier’s skin care items, I was intrigued by Solution because it actually contained effective active ingredients that could very well deliver good results. So, I decided to give it a shot and leave myself open to the possibility of being pleasantly surprised. So, let’s start with the ingredients, since they are what sold me in the first place. I was optimistic when reading them, as it certainly features effective exfoliants. Combining BHAs, PHAs, and AHAs makes for a product which could deliver impressive results. However, not everything really added up…literally. The primary BHA and acne-fighting ingredient in Solution is salicylic acid. But, it doesn’t have enough of it, in my opinion. See, it only has a 0.5% concentration of salicylic acid, which isn’t enough to really make a difference on acne. But, I was hopeful that combined with AHAs and PHAs, it could deliver. But my first impression was unfortunate. The bottle is difficult to use, and the Solution squirted everywhere. I have an aversion to products which require you to use a cotton pad, as I always find it more effective to apply products with my hands unless it’s a cleansing water. This bottle wasn’t that friendly to hand application and was difficult to use even with a cotton pad. Then came the application. Solution has a light, watery consistency and is easily absorbed by the skin. However, I put an adequate amount on my skin and was immediately met with a burning sensation. This wasn’t the satisfying tingle of a perfectly formulated acid, but a painful, uncomfortable burning sensation. It was really rough for my sensitive skin, and applying it was uncomfortable and slightly concerning. So, did it work? I started the course fighting some breakouts on my forehead that had cropped up after a month of traveling. I knew my regular products would do the trick, but I decided to give Solution a try on top of them. Looking at my before and after pictures, I can see improvement. However, knowing my skin well, I know I can’t completely chalk this up to Solution. Rather, it was the natural improvement that I always see when continuously using my holy grail products in an effective routine. And I did notice the mornings following the one or two nights I skipped Solution my skin looked better than it had the entire week. Most notably, it was less red and irritated, which, by the end of my test period, I determined was being caused by continuous use of Solution. Is Solution effective? Kinda. It’s not that it doesn’t work, it’s just that it doesn’t work well, and certainly not better than many other products on the market. If Solution’s ingredient list were a book, it would be “Chemical Exfoliation for Dummies,” which means that it’s great for those who are just starting to explore with acid toners (and who don’t have sensitive skin!). + We’d love to read your Glossier solution review! Share it with us in the comments! Also, ask us any questions about the product below! What should we review next?